Some illustrations of this fabric may be found in my previous posts: forming long loops and stitches using cast on comb and weights or ruler , some long stitch swatches, a few more tips and ideas from the earliest post on topic. 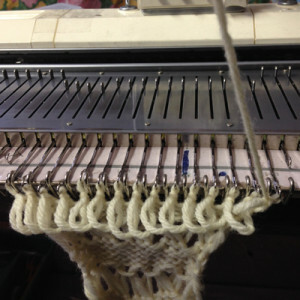 Here are some ideas on creating a basic 3 loop “broomstick” cross. 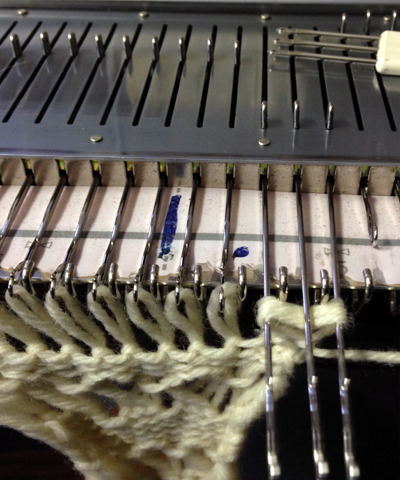 Most of my teaching has been on 4.5 mm machines, so the above swatches were executed in thinner yarns. 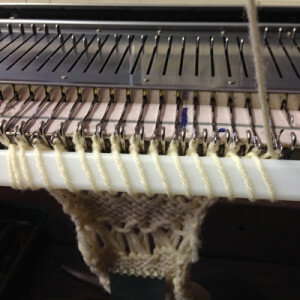 For this post my swatch is knit in a random scrap yarn from my studio, on the 260 Brother Bulky machine. 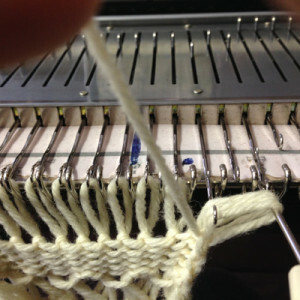 The basis of this type of stitch is to create long loop stitches, and in turn to re- hang them in various configurations. The look I prefer among others I have tested, results when loops are hung in on every other needle, whether singly or in groups, and the next row is simply knit. Here, as in any machine knit fabric, if there are 2 or more empty needles side by side, any other than a single needle must be e wrapped, cast on, or have a loop lifted up from the row below (used in increases), or the result will be a ladder vs. knit stitch formation on that needle. 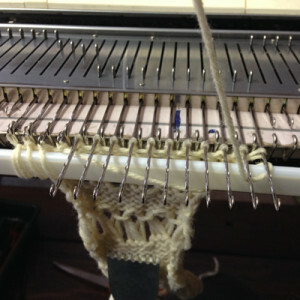 Begin with waste yarn and some rows of knit. As long stitches are formed, some weight will be required to keep loops from jumping up, forward, and off the KM. Since you are asking the loops to stretch quite a bit on a fixed width metal base, some testing is required to determine the best tool for forming the optimum loop length. Yarn thickness factors into this as well. 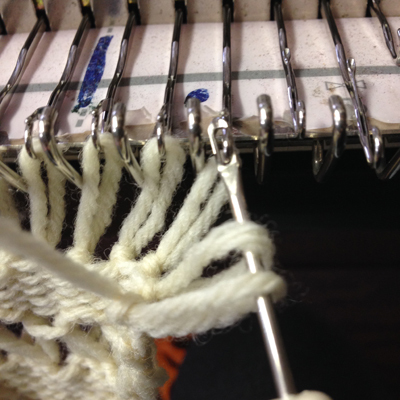 I found knitting stitches back to A loops too short, and using a cast on combs and paper clips or any of my rulers made them too long, so I opted for the plastic rod insert from one of my window shades. 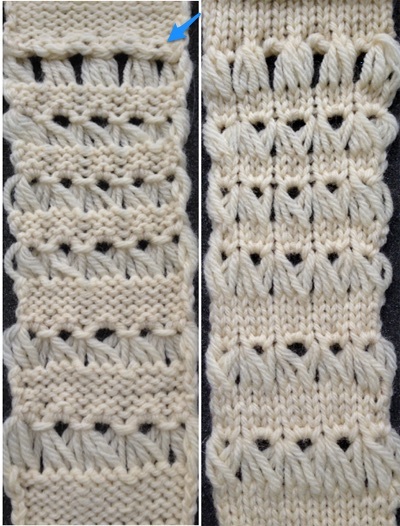 I like to work my loops from left to right, so the last row is knit from right to left. They may certainly be formed in either direction. 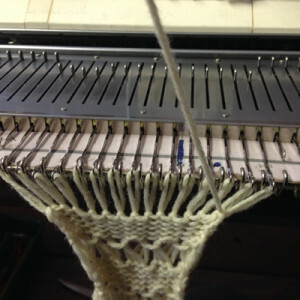 In this instance, COL needs to be returned to the right before resuming knitting. 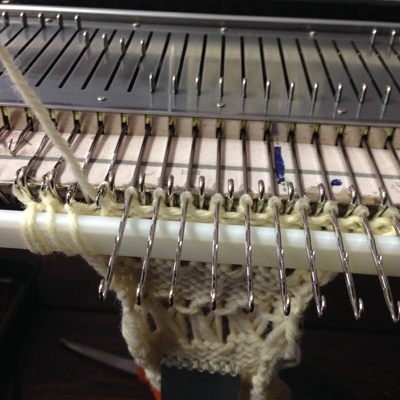 This can happen before or after forming long stitches, by any method you like. Consistency helps eliminate errors. repeat across row COR: knit 3 rows (or more, odd #), ending with COL, so the yarn tail will once again be on the left to begin the process of wrapping. Hairpin lace diagrams can be a source of design inspiration for designing loop configurations. 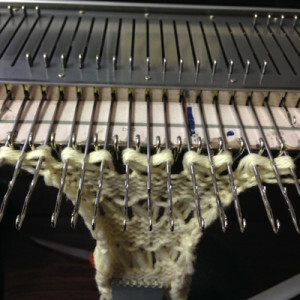 The crochet cast on any empty needles could be used where chains occur in crochet diagrams, and it needs to be loose enough for the next knit row to be formed easily. In my swatch I actually had to hand knit the first/ next row, my carriage jammed in the areas where the triple loops were in needle hooks as well as my cast on chain. 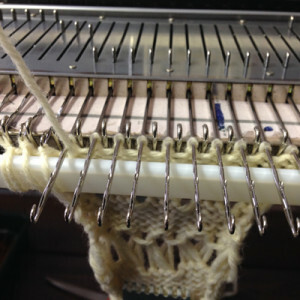 The number of knit rows between forming the long stitches may be odd or even, providing one gets comfortable with working in both directions. The carriage gets switched frequently from side to side. Sometimes the least likely to drop your work carriage “free pass” is simply to take it off the machine on one side, bring it to the opposite side, and engage it on the machine once again, with no need to change cam settings or worry about traveling with it across your knit piece.